That $2,500 Salary is substantial. Plan your Human Capital well. Writing more and talking to more people, I realize some of our problems as human beings is not able to take information we experienced daily, reflect and understand them well, and make good decisions. One information that we tend not to interpreted well is our pay compensation. We tend to look at our pay compensation on a monthly basis, and as person that start working, $2,500 per month doesn’t look like a lot. We get angry with society for a high cost of living, chiding the government for not keeping things affordable. We chided with ourselves for not studying well, or have a great network, good negotiation skill to get $4,000 per month starting salary. That sounds like the complaints that I hear often. If we have filtered out a lot of the noise (our angst, our regret), you will realize that you are in control of how you spend that $2,500. Effective budgeting and allocating your $2,500 can provide much clarity, purpose and control to your life. To build wealth, it helps to understand the immutable formula for wealth building. However, if we don’t say this out, some will keep looking to different ways to build wealth without realize what are their most important asset. Its not your home, its not you CPF. Your education, in academic and in life, puts you the most important asset at your disposable. $2,500 per month doesn’t seem like a lot. 12 months + 1 month bonus comes up to $32,500. A 3% increment on that $2,500 is $75. That looks like a sum that is insulting, but essentially percentage wise, its not that insulting. Project forward your miserable monthly pay with your less than amusing increment for 10 years, and you will earn $372,576. That’s almost the cost of a build to order flat. How come we don’t see this amount? That’s because nowadays, we don’t receive this amount in an envelope. You cannot hold this amount in your hands and feel how substantial it is. If its tangible, you felt that you have to be responsible with this amount. Today we live in a cashless society. Your pay gets credited into your bank account. You don’t see it at all. You just go to an ATM or use NETs to spend it. Planning is the furthest thing on your mind. Wonder if, you could just, plan well, you could perhaps just, save 25% of that for $93,000. Channel this amount to building wealth and you can kick start in a small way to planning your financial independence. It is likely you don’t see this amount, you don’t plan, you don’t have a clarity where it went to, and then you reflect one day when you are 45 years old, thinking, where did all these money went to? Do it well and you enhance that 3% to 7% or 10%. 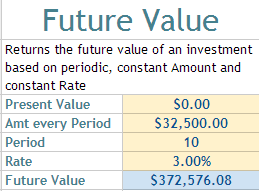 If you progress to make $60,000 per year, the next 10 years you will accumulate $687,000. 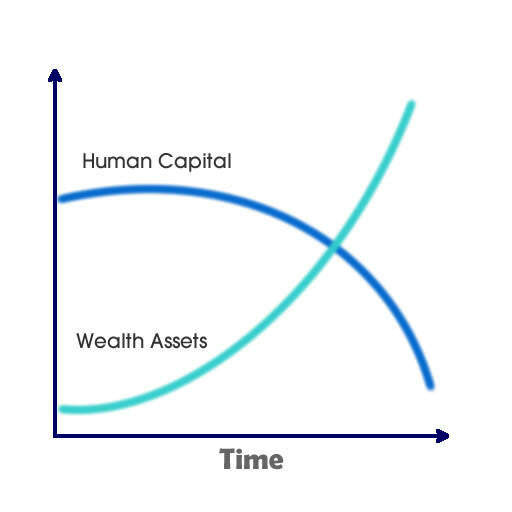 If you concentrate on building wealth but failed to progress enhancing your human capital, you lose out on substantial and predictable “capital gains”. Your investments might or might not generate the desired returns, but your pay compensation have a higher degree of predictability. In light of this, it is important to channel adequately to wealth building. Your wealth assets builds up while your human capital goes down. Your wealth assets provides a safety net / contingency plan / alternative income source in case life throws you a curve ball. You generate such a substantial amount that, the loss of that capability will cause distress in life itself. All your dependents need you to be working. And thus it becomes important to cover yourself adequately with disability income insurance. Disability Income insurance typically covers 60-75% of your last drawn income. Depending on the insured amount, they tend to cost $40 per month to insured an income of $2,000 per month to the age of 65 should you not be able to work in your trained profession. The underwriting for disability income can be very stringent. Do declare any pre-existing conditions well in case, when you need it, they find fault and find you ineligible to claim. The short sighted inability to evaluate figures in aggregation result in most of us not being able to realize that we can evaluate whether we want things now or plan for the future. You are your biggest asset, and enhancing it may bring more satisfactory returns versus channeling more efforts to building wealth. Yet, building wealth is important simply because as time passes, it provides an opportunity for you to step down, take things easier. Start by learning how to better plan your human capital today. Agree. The problem is that a lot of pple wants to have passive income without concentrating on their first tranche of money – which is active income. Both are equally important, but I dare say that active income is more crucial during the earlier part of our lives. We have to build the capital before we can deploy them. This simply means concentrating on your career and just plain old savings. The second part of our lives is where we see the results of our capital deployment. hi LP, thanks. i think many, such as myself search hard and gain that competency to carry out active management (lots of work) that somehow you get tricked that this is the holy grail to getting out of the rat race, when for a lot of folks, enhancing human capital reaps much better. similarly, folks don’t develop enough knowledge to build wealth wisely to grow it in subsequent years. it boils down to how each individual want to live in the lifestyle they seek.. for singles I think is ok.. but to start a family, it may be not so easy.. Very true about building wealth passively vs actively. You cannot have the opportunity to grow a retirement portfolio without first having substantial savings in the first place, which is then dependent on human capital. There are many ways to build human capital. In a place with high population density like Singapore, you do not just seek a higher education by continually upgrading, because everyone is doing so too. PR skills and social networking are also necessary, if not can be more important. Kyith, since you mention about disability income, are you insured for this? I personally find disability income insurance too expensive to my liking. 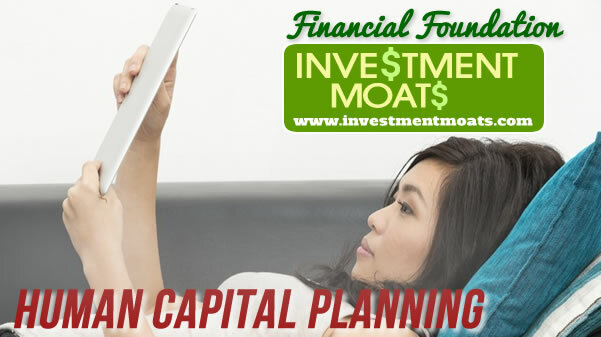 If it is difficult for a person to save up money for the future with a $2k income, a $40/mth premium, which amounts to 2% of your income, may be better saved up for wealth building. Hi Jomel, i am not sure if you have mistaken. That is assuring 2k per month up to the age of 65 years old. So it can be rather substantial. I am insured under Aviva Ideal income. Yesterday i had a re-evaluation with my IFA. i think its rather cheap. Strict underwriting. It sounds like it makes more sense to go for highest pay offer than personal interest or future prospects. I.e., 10k pay that works 24/7 with no chance to promote vs 3k job with opportunity to be in higher management. Active income for first few years and passive income for the remaining years seem like the best option. if you work 24/7 somethings got to give. again what is the use of trying so hard and knowing you have to spend the next 30-50 years doing something? if you can earn that 3k, perhaps finding you can build competency in a certain area and grow to love that job and not thinking of retiring. it is not bad as well.